“Twisted Threads” by Kaylin McFarren is an action-packed, psychological romantic mystery/thriller readers will simply devour. This multifaceted adventure is the fourth novel in the Threads Series, this time set on a Caribbean cruise ship. 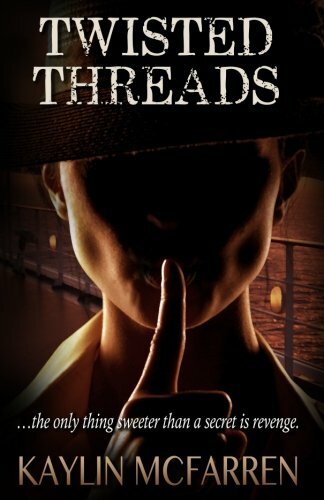 True to its name, “Twisted Threads” is full of twisty drama threaded together with manipulative plot spins, shadowy characters, heartfelt romantic entanglements, and even a bit of sensual erotica. Taking the lead in the story is Akira Hamada, a beautiful Japanese geisha who unwillingly relinquishes all hope of a normal life when she is forced to work as an assassin for the crime lord that destroyed her lover. Her mission is to avenge the brutal murder of the crime lord’s sister–or face her own certain death. When Akira meets Devon Lyons, the walls around her outwardly impenetrable façade soften and for the first time in a very long time, she dares to dream. The couple fall fast and hard for each other, yet Devon is unaware his aunt and uncle are the targets of Akira’s assignment. Nothing and no one are as they seem, and with a string of mysterious deaths aboard the ship, plus a killer on the loose, secrets that are best kept buried threaten to rise to the surface and take down everyone in the way. From the very start, McFarren hooks the reader with an enigmatic mystery character who is ready for vengeance, then swiftly moves to a grisly scene revealing a ferocious protagonist who takes down the enemy as if merely swatting flies. That’s just the first few pages, and the action never stops. The beauty is in the author’s seemingly unfailing ability to write enthralling, convincing scenes, be it a bloody battle to the death or a hot and steamy love scene. The detail in her writing propels the reader forward, as she drops bits and pieces of clues along the way, only to insert twists that leave you guessing and wanting more. Well developed characters provide authenticity to the overall tone of the story. There’s the one guy everyone loves to hate, the nagging wife, the doting, unhappy husband who only tolerates his wife because she has loads of money (and he is afraid of her), the self-important captain of the ship, the star-crossed lovers of course, and plenty of well-rounded extras who help take the story to the next level. Readers will definitely experience a range of emotions as they follow the travails and triumphs of these feisty characters. I thoroughly enjoyed “Twisted Threads” by Kaylin McFarren from cover to cover. The layers of deliciousness never ends, and the seamless writing that incorporates multiple genres into one engrossing story, truly provides non-stop action and entertainment for all tastes!